A small town of eastern Rumelia, twenty-four miles from Philippopolis, containing a Jewish community of 1,700 in a total population of 17,000. It is said to date from the year 1492, or, according to Bianconi, from the expulsion under Philip II. toward the end of the sixteenth century. There are three tombs of undoubted antiquity, namely, that of Samuel Béhar Abraham, who died in 1644; that of Peni, wife of Solomon Levi, who died in 1659; and that of Rabbi Isaac Azriel, who died in 1709. Among other antiquities may be mentioned a scroll of the Law, in the possession of the congregation, written by a certain Rabbi Albo in 5547 (1686); another scroll, by Ḥayyim Israel Galipapa, a rabbi of the seventeenth century; and a set of silver "bells" for the scrolls, presented to the synagogue in 1774 by one Abraham Sedi. Strange to say, the Jews of Bazarjik have preserved no chronicle of any important events in their history. The native Mussulmans of Tatar origin—hence the name "Tatar Bazarjik"—terrorized Bulgarians and Jews indifferently. 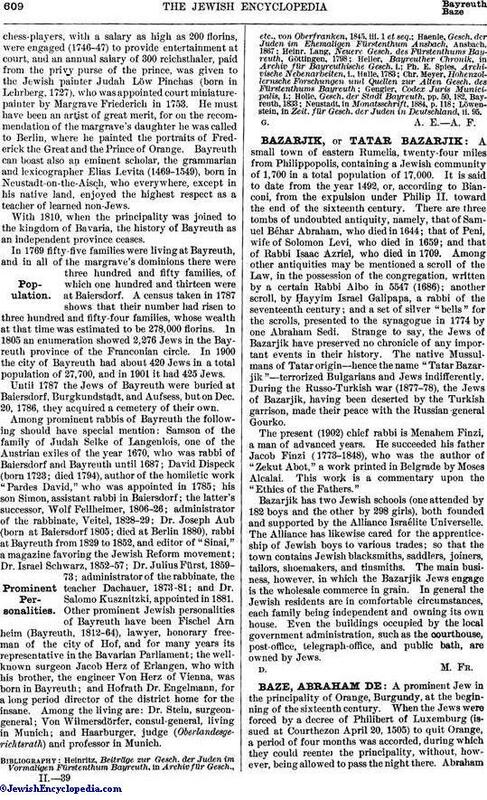 During the Russo-Turkish war (1877-78), the Jews of Bazarjik, having been deserted by the Turkish garrison, made their peace with the Russian general Gourko. The present (1902) chief rabbi is Menahem Finzi, a man of advanced years. He succeeded his father Jacob Finzi (1773-1848), who was the author of "Zekut Abot," a work printed in Belgrade by Moses Alcalai. This work is a commentary upon the "Ethics of the Fathers." Bazarjik has two Jewish schools (one attended by 182 boys and the other by 298 girls), both founded and supported by the Alliance Israélite Universelle. The Alliance has likewise cared for the apprenticeship of Jewish boys to various trades; so that the town contains Jewish blacksmiths, saddlers, joiners, tailors, shoemakers, and tinsmiths. The main business, however, in which the Bazarjik Jews engage is the wholesale commerce in grain. In general the Jewish residents are in comfortable circumstances, each family being independent and owning its own house. Even the buildings occupied by the local government administration, such as the courthouse, post-office, telegraph-office, and public bath, are owned by Jews.